The papers will be evaluated by 2 independent reviewers, not affiliated with the same institution, in the blind Peer-Review system. – The author respects the recommended structure and technical details regarding the study writing. – accept the publication of the article, with minor revisions. – rejection of the article. In each of the three situations, the author is informed by email about the outcome of the evaluation and any observations, comments and recommendations of the reviewers. The authors are required to send the modified study by the date they have been communicated by their chief editors or by the number publishers. The maximum period of time between the manuscript submission and the final decision should not exceed 3 months. For further information on the assessment criteria you can download the Review Form. The final decision regarding any paper publication belongs to the Editors-in-Chief. The publishers are required to ensure the transparency of the assessment act in terms of the criteria applied and the reasoning of the decision. 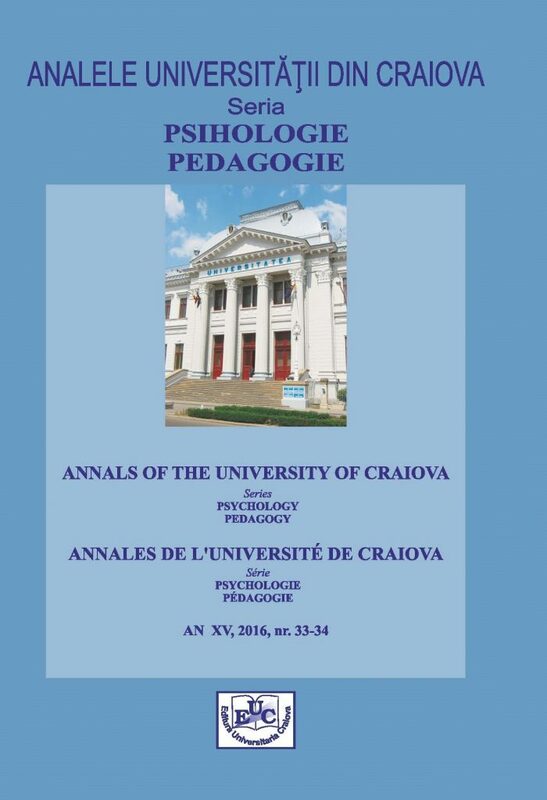 The Annals of the University of Craiova, Psychology-Pedagogy series (ISSN 1582-313X) is a biannual academic publication edited by The Teacher Training Department (Romanian acronym DPPD), through the Center for Psycho-pedagogical Research (Romanian acronym CCPP). Copyright © 2019 Annals of the University of Craiova, Series: Psychology-Pedagogy. All Rights Reserved.